The gluten-free lifestyle is becoming more popular by the day. In fact, studies show that between 5% and 10% of all people in the U.S. may suffer from a gluten sensitivity of some form! These are just a FEW of the possible symptoms. They can become more serious the longer someone is consuming gluten while having a sensitivity. It’s safe to say that if you are sensitive or allergic to gluten, your life can change for the better when you stop consuming it. I was one of those people. My life changed overnight after I stopped eating gluten. I immediately felt happier, had more energy and had much less abdominal pain. It’s one of the reasons I opened a 100% gluten-free eatery! I often get asked about how to make eating gluten-free (and vegan/plant-based too) more affordable. First of all, I will say the benefits you can experience from taking processed food (and gluten if you are intolerant) out of your diet and adding in more clean organic plants are well worth it. When I say it can change your life, that is not an exaggeration. Is your life dramatically improving worth a few more dollars a week onto your grocery bill? That’s a question only you can answer. With that said, if you are looking into gluten-free living and are concerned about affording this new lifestyle; it doesn’t have to be so expensive! You might see a small increase in money spent, but like I said above, it doesn’t have to be more than a few extra dollars per week. 1. Stay away from the processed gluten-free foods! I recommend this for multiple reasons. Processed food is almost always going to be more expensive than you making it yourself. Are you craving chocolate chip cookies? Find a great recipe online and then make them yourself at home! With processed food, you are paying for someone else to make the food for you and then package it and market it and so on. 2. Get your booty into the kitchen! When you cook your own food, YOU control the ingredients. You control the quality of what you are eating and you control the cost. You are worth the time it takes to create a healthy meal for yourself, my friend. Your body and your future self will thank you. 3. Buy your grains and legumes in bulk (they are great substitutes for pasta). Your local health food store should have bulk bins for your grains and legumes and this option is going to be cheaper than packaged. You can buy only what you need and you’re not paying for labeling, marketing, etc. 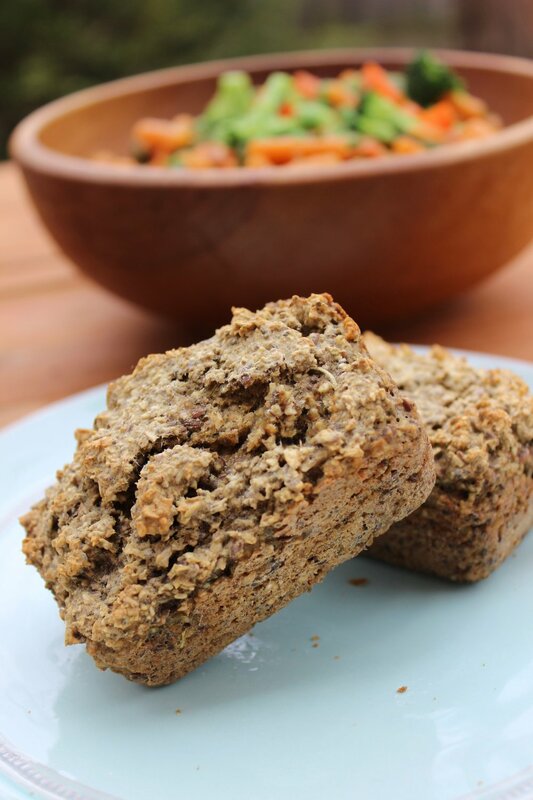 You can use grains like gluten-free oats to make your own breads, which you will see in my recipes below. 4. Make your own veggie noodles! Okay, this sounds time consuming, I know. But spiralizing veggies like zucchini really can be very quick and easy and so much more affordable than the packaged gluten-free pastas. And they are way less calories too and I would venture to say – more fresh and vibrant. Just Google “veggie spiralizer” and you’ll find the kitchen tool you need. You can also just use a veggie/potato peeler to make your noodles. 5. When you do go with boxed gluten-free pasta – purchase the box that uses the least amount of ingredients (I love 100% lentil pasta). When you get home, instead of adding a bottled sauce, make your own (I give you a yummy and easy recipe below)! Then add tons of veggies like steamed broccoli, peas, carrots and even greens like we use in the recipe below. This helps you get more life out of your past and more veggies into your diet – win-win! I prefer to make fresh veggie noodles for my pasta dishes, but when I’m in a pinch this dish works every time with my family. 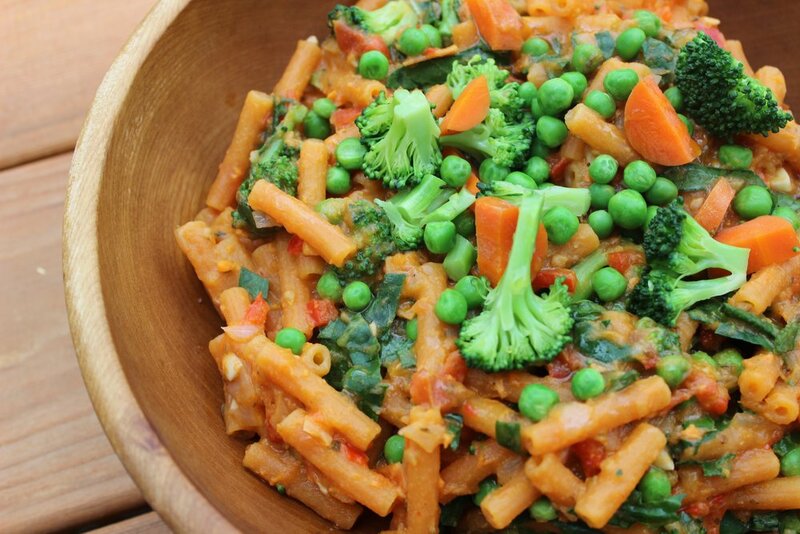 It’s quick and easy and even though we are eating boxed pasta, it’s made with 100% lentils and served with tons of veggies. The dish is full of fiber, color and flavor. It's not just for adults - kiddos love it too - mine sure do! To make your sauce, start with your olive oil over medium heat and add your onion, garlic, salt, thyme and oregano and allow to sauté for about 2 minutes. Add your red pepper and allow to sauté for another minute or so until the pepper pieces are tender. Now add your diced tomato and sweet potato. Stir, turn to low, put the lid on your pan and allow to simmer for 10 minutes. While your pasta sauce is simmering, boil your water for your pasta. When it’s ready, add your pasta to cook. I like to steam my broccoli, carrot and peas while the pasta cooks in my steamer/strainer pot that fits over my pasta pot. It’s a great time saver! While your pasta is cooking, add your sauce to your blender and blend for about 20 seconds to create a creamy sauce that’s still a little chunky. Strain your pasta and put back into your pan with your sauce and all of your steamed veggies. Add your collards to the pan and they will quickly wilt. Serve hot and enjoy this deliciously fresh and filling meal with the ones you love. I’ve been making these for years at our house. It’s so quick and easy and just happens to be gluten-free. They take 10 minutes to make and 25 minutes to bake. I really love this recipe because the bread can be eaten as a savory bread or a sweet treat ~ it’s the perfect blend of both. So make it as a treat or even for your open faced sandwiches and toasts. Turn your oven to 375 to preheat. Blend your bananas and water in your blender for about 30 seconds until liquid then add to your dry ingredients in the food processor and process until a dough forms (about 10 seconds). Bake for approximately 25 minutes. You will start to smell the bread and see the top starting to brown – this means the bread is almost ready! Would you like to take a class with me? Check out our class lineup and details on how to sign up HERE. Want to see video of me making and talking about these recipes? Check out my IndyStyle episode HERE. Thank you for reading and I hope you enjoy making these recipes at home for yourself and those you love.